The firm of Goldstein and Stamm, P.A. prides itself on its tireless efforts on behalf of its clients, aggressive courtroom style, and thorough knowledge of complex areas of the law. 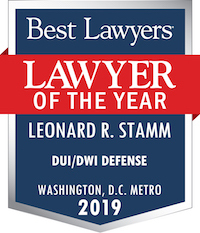 Leonard R. Stamm is a Maryland DUI lawyer with over 30 years of experience dedicated to zealously representing clients charged with drunk driving, driving under the influence (DUI), driving while impaired (DWI), and other criminal and vehicular offenses in state and federal district, circuit, and appellate courts throughout the state of Maryland. He understands the profound effects that can result from criminal or traffic convictions (or even from probation before judgments) and works aggressively in an effort to get the best possible outcome on behalf of all the firm's clients. For many of our clients this is their first encounter with the police and the court system. We are committed to being by your side through the whole process to help protect your rights while ensuring that you understand what is happening both in court and at the motor vehicle administration. Drunk driving defense is one of the most complex areas of law, requiring extensive experience and expertise. The lawyer must carefully review all aspects of the State's case, from the basis for the stop, the officer's decision to require the driver to exit the car to perform standardized field sobriety tests, the administration and interpretation of standardized field sobriety tests, the advice of penalties for failing or refusing a chemical breath or blood test, and the administration of the test itself. Many drivers have medical conditions that may mimic some of the signs and symptoms of impaired driving. It is possible to produce medical records showing that even before the arrest that the defendant suffered from a condition that the officer may have mistaken as indicating impairment. 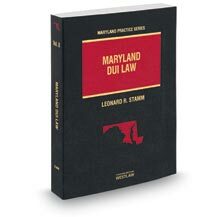 Before the initial consultation with a Maryland DUI lawyer, clients may be sent extensive questionnaires to enable to lawyer to properly assess the case. At the consultation, the lawyer will review the events in detail, to determine the likely defenses at the MVA and in court. It is important to act quickly after an arrest, because if the driver wishes to contest a proposed suspension by the Maryland Motor Vehicle Administration for failing or refusing a breath test, a hearing request must be mailed with the required $150 fee, within 30 days from the arrest. It is unusual to see a drunk driving case where there is not some defense available to beat or reduce the charges. In most DUI cases, prosecutors offer plea deals that are no better than what would happen after losing a trial. So there is usually little downside to fighting the DUI/DWI case in court and at the MVA. Goldstein & Stamm, P.A. represents individuals charged with traffic offenses including: DUI/ DWI /Drunk Driving, Motor Vehicle Administration (MVA) hearings, Commercial Driver’s License (CDL) cases, Ignition Interlock cases, Federal DUIs, Driving While Revoked and Driving While Suspended, Driving Without a License, Driving in Violation of a License Restriction, and Provisional Driver Licenses. The firm also has extensive experience dealing with cases involving automobile manslaughter and vehicular homicide, hit and run, fleeing and eluding, speeding, and provisional driver license cases. Goldstein & Stamm, P.A. also represents clients charged with criminal misdemeanors and felonies, violation of probation, University of Maryland student misconduct, cases in juvenile court, expungements, and appeals. The firm represents individuals charged with crimes and traffic offenses throughout the State of Maryland, including Montgomery County, Prince George’s County, Howard County, Anne Arundel County and the surrounding areas. Additionally the firm handles federal cases in Greenbelt, Baltimore, Fort Meade, Andrews Air Force Base, Aberdeen Proving Grounds, and Fort Detrick. If you have been charged with drunk driving or other crime it is important to promptly consult with an attorney to review all the defenses available to you, answer all of your questions, and help guide you through the process. 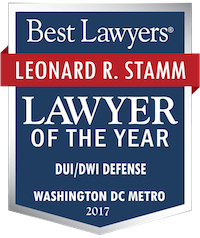 For a FREE consultation with Leonard R. Stamm please call 301-345-0122 . All credit cards, including, Visa, Mastercard, and American Express are accepted. Paypal is also accepted. 1. Leonard Stamm was selected to the Super Lawyers list, Best Lawyers List, Martindale Hubbell, and AVVO. The Super Lawyers list is issued by Thomson Reuters. A description of the selection methodology can be found at www.superlawvers.com/about/selection process detail.html. A description of the selection methodology for Best Lawyers can be found at https://www.bestlawyers.com/Methodology. Selection methodology for Martindale Hubbell can be found at https://www2.martindale.com/ratings-and-reviews. The selection methodology for AVVO can be found at https://support.avvo.com/hc/en-us/articles/208478156-What-is-the-Avvo-Rating-. These advertisements may not have been approved by the any court. Baltimore to Stop Prosecuting Marijuana Possession Cases The State's Attorney for Baltimore City, has announced on January 29, 2019, that marijuana possession cases will no longer be prosecuted in Baltimore.